In 1861, France under Napoleon III was caught in the dream of a Second French Empire. This time, rather than attempting to conquer Europe first, France expanded their colonial holdings around the world (ultimately being badly defeated by Prussia towards the end of the decade after they turned their attention to Europe). Essentially they would invent reasons to invade and conquer smaller countries. One of those countries was Mexico. Mexico was coming off a major loss against the USA in the Mexican-American War and had sunk into a decade of internal strife, during which it was accruing massive debts -- some of which were owed to France. Seeing an opportunity, France invaded Veracruz, Mexico with a small army of 6,000 soldiers. President Juarez fled Veracruz and assembled a 2,000 strong battalion of irregulars that summarily defeated the larger French army on May 5, 1862 in what became known as the Battle of Puebla. The French persisted for another 5 years before finally retreating in 1867. The lesson? Small victories can trigger major game changing events. 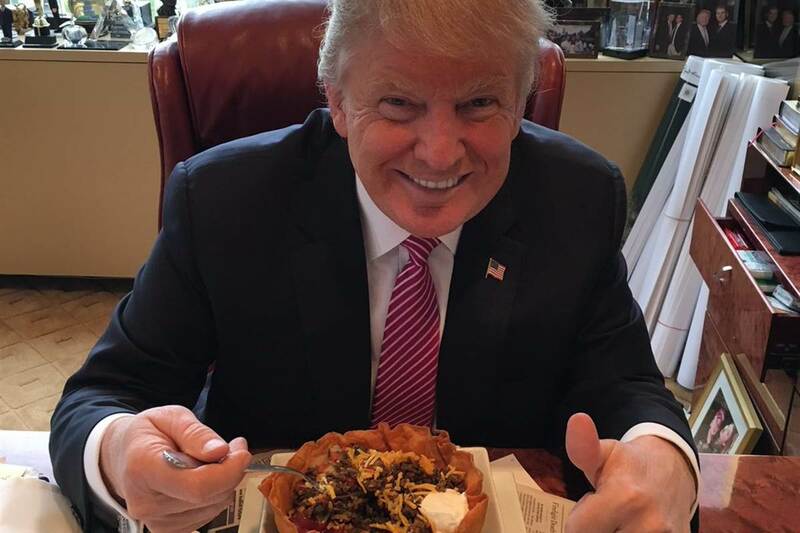 Trump eating his celebratory Cinco de Mayo Taco Salad. What makes you sure that there is collusion (between Trump campaign and Russians)? Representative Swalwell (CA-15) maintains a #TrumpRussia connections page on his official House website. So when he answers Brianna Keiler's question on whether he believes in collusion by saying, “Yes I do, and I have seen the evidence on the unclassified and classified side,” you sure listen. Things are falling into place piece by piece. Small victory after the next. So let Trump celebrate his party's attempt to trade healthcare for 30 million people for $1 trillion in tax cuts for the wealthy, because he's on the wrong side of history, the wrong side of the law, and he's going to face the consequences soon enough.